This is a $20 gold coin. It is money as defined by our American Constitution. It is real money. It can not be inflated. This paper money was once redeemable at any bank for real money. Click to see an enlarged view. This paper modern money is fiat currency. It is in no way shape or form tied to, or backed up by, "real" money as defined by the American Constitution. This money can therefore be printed to great excess and devalued. It is not a "just weight or measure." This money will eventually fail to buy much of anything. I read somewhere that hyperinflation is when the rate of inflation exceeds 100% in a three year span of time. America has never experienced hyperinflation, but there are plenty of economic prognosticators who seem pretty sure we will in the near future. They say it is inevitable. Then again, there are some prognosticators who assert that America will not have hyperinflation. Which brings to mind the old joke about asking three economists a question and getting five different opinions. America has, quite simply, borrowed more money than it has the capacity to repay. Besides that, we have clearly promised more in the way of benefit programs than we have the ability to deliver. This is a recipe for disaster. 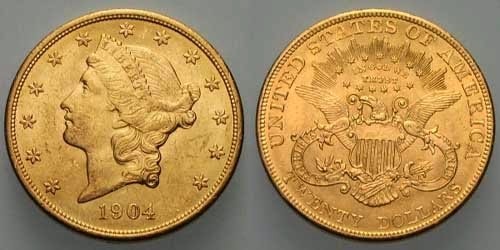 Furthermore, I know full well that the American dollar is no longer backed by anything of value (i.e., gold and silver, as was once the case). And I know that economic systems built on paper (fiat) money always eventually collapse. One way they collapse is through hyperinflation. And when that happens, common people—those who have worked and saved and invested in conventional investments—lose everything. Even if we don't see hyperinflation, we will see continued inflation, which, in itself, is bad enough. According to ShadowStats.com, America's true inflation rate is currently almost 10%. So, at that rate, instead of seeing 100% inflation in three years, we'll see it in ten years. Of course, the government tells us that inflation is currently low. But they are continually tweaking their "official" numbers to make inflation look like it's less than it actually is. How can we trust a government that violates the 9th Commandment like that? "By a continuous process of inflation, governments can confiscate, secretly and unobserved, an important part of the wealth of their citizens. There is no subtler, no surer means of overturning the existing basis of society than to debauch the currency. The process engages all the hidden forces of economic law on the side of destruction, and does it in a manner which not one in a million is able to diagnose." It turns out that modern governments actually prefer a little inflation. I've read that the Federal Reserve likes to try and maintain a steady 3% inflation. That's fairly subtle, yet it's a sure way to steadily extract wealth from the citizenry. It's like a hidden tax. And it's all so easily done when you have a fiat currency. Taking money like that from people is a violation of the 8th Commandment. According to This Online Inflation Calculator, it takes $472.48 in today's dollars to purchase what you could buy for just $20 in 1913. So the U.S. inflation rate for the past 100 years has been 2,262.4%. Hmmm.... that's looks like more than 3% a year. I've stated it here before, and it's worth repeating.... Any government-managed economic system that stealthily extracts value from the hard-earned dollars of its citizens is immoral. Worse yet, any nation that borrows money, with the intention of having the next generation pay the bill, is also immoral. To say that something is immoral these days is to say something controversial. That's because when a person declares that something is immoral, that person is being judgmental. He is declaring that there is a right and a wrong. That's just not politically correct. We live in a relativistic age. Right and wrong is now situational. People hold different ideas about what's right and what's wrong. Your opinion of right and wrong might be different from my definition. So people are coming up with their own religious belief systems—deciding for themselves what right and wrong are. This is, of course, a deadly quagmire for any society. It is deadly on a social level, and on an economic level. It so happens that social systems and economic systems walk hand in hand, so to speak. As a Christian, I believe that society's standards of right and wrong should not come from the wavering opinions of men—even democratic majorities of men. I believe these standards should come from a transcendental source, meaning, from Scripture, which is God-inspired. I happen to believe that when a civilization bases it's standards of right and wrong on God's law, as revealed in scripture, that civilization will be blessed. Likewise, I believe that when a civilization ignores God's law, it will be cursed, which is to say, it will meet with destruction. I think there is ample historical evidence to support these beliefs. It so happens that the Bible has a lot to say about economics and righteous economic systems. For example, in Leviticus, God makes it clear that those who live according to his law should have a system of "just weights and measures." Our current fiat money system is not operating in accord with that law. Far from it, and we will suffer for it. We will suffer greatly. In This Recent Episode of one of my favorite countercultural, biblical-worldview, social-commentary programs, co-host Dave Buehner sums up the situation America finds itself in vis-a-vis God's law. "The foundations of our economic system are going to be destroyed. They're falling down around us right now. We're twenty trillion dollars in debt on paper, but, really, it's closer to 100 trillion dollars when you look at unfunded liabilities, and when you look at state debt and personal debt. The number exceeds the wealth of the world. And that's just this country. We're in deep financial problems right now. As soon as the U.S. currency is no longer the world's standard... all bets are off. So the foundations of our economy are being destroyed right in front of us. When the foundations are destroyed, what will the righteous do? [Psalm 11:3] Well, the righteous, see, they are built on better foundations. They are built on the word of God. We're trying to construct our lives, including our economics, upon a foundation that is the word of God, and the word of God is very clear on some of these economic issues. It says, you don't work, you don't eat. It says, if you don't take care of your own family, you're worse than an infidel. So take care of your family. It says a good man leaves an inheritance to his children's children. He [God] says do not steal. So, we're taking these principles and we're trying to bring them down to a very pedestrian, situational level [of] how to live those out in this world, in this place, at this time." What Dave Buehner is advocating is that Christians recognize the failures of our ungodly economic and social system and, as much as possible, not cooperate in it. It is a contra-industrial call to cultural reformation on an individual and family basis. I couldn't agree more! Let's get definitions straight-Inflation is an act of government to make the supply of money larger than it was. This act results in spiraling price and wage increases. the government can artificially suppress the spiral for a while but it will eventually get out of control. Richard J. Maybury explains this in his book "Whatever Happened to Penny Candy." I highly recommend this book to understand economics. Thanks for the definition. I don't disagree with it. I think it coincides with what I've written. Clearly, the government can't increase the supply of specie (gold & silver) like it can paper money. More paper money in circulation dilutes the value of all paper money in circulation, thus stealing wealth (the purchasing power, or value) of money that people have earned and saved. Did Mr. Maybury offer any solid advice in his book for how to get through a hyperinflationary nightmare ? here is another interesting article on American wages measured in gold. Good stuff to chew on as always. Thanks! Eagerly awaiting part 2. I finished the Crash Course that you posted a while back and it should be taken by anyone serious about knowing what is going on. Wait until even the slow to learn figure out how they have been lied to by both parties. On No! Congress is back at work (the furlough ended). Quick, Herrick, we need Part 2! I found the Economic Crash course from your previous post most helpful when he explains what a dollar is and how it is created. The comments on how then does everyone pay the interest explained everything to me...Why a Gold standard is so abhorrent to many people and why the money supply is expanding exponentially. Hyperinflation becomes inevitable when it is politically unpopular to make the right choices to keep inflation under control. The recession that comes afterwards to fix the hyperinflation can only happen after the populace is completely crushed and begs for the inflation to stop. The events in Washington these last few weeks demonstrate that we are no where near ready for the recession that will fix all things. It will surely be much worse than the Great Depression. I think the only way through this is to buy land and stick with heirloom garden seed and heritage breed livestock where you can save seed from the previous year to plant for the next year, or use the offspring from the previous year to reproduce for the next year. Save seed back so you can handle crop failure two or three years in a row and so you can help others. What is coming will last far too long to ride it out by hoarding food or gold now. One needs to consider every purchase from here on with an eye towards whether it will be an asset or a liability when there is no gas or electricity to run it. Problems and difficulties create opportunity and we are going to see tonnes of opportunity and fairly soon I expect. Which broadcast date from Buehner are you referring to? The link just goes to their homepage. That's odd. The link takes me to "Welfare Mobs Strip WalMart," which was the 10/15 broadcast. I'm pleased to know that you listened to the Crash Course. I hope your comments will be an encouragement for others to listen to it. And I think you are thinking right, Ron. "According to This Online Inflation Calculator, it takes $472.48 in today's dollars to purchase what you could buy for just $20 in 1913. So the U.S. inflation rate for the past 100 years has been 2,262.4%. Hmmm.... that's looks like more than 3% a year." I get just over 3.2% as well. When interest builds year over year, as interest does, it is compounding. ECON 101. You're right. I didn't take compounding into account. Compound theft adds up to a lot over time. This Web Page shows the monthly and yearly average inflation rates for the past 100 years. It ranges from 18% to -10.5%. But the government formula for calculating inflation has changed over the years so I don't know how accurate it all is. The bottom line is, of course, that fiat-money inflation is a devious mechanism for robbing the people unawares. As long as the economy is growing and prospering, few people notice or care. But that is certainly not the case now, and we are surely experiencing inflation in energy and food prices beyond what the "official" numbers show. I think inflation over the last 5 years is higher than 10%. A lot of stuff I buy has doubled in price (like pet food). Anything containing sugar and corn syrup is up from 40% to over 100%. Sea food is unaffordable and what is affordable is farm raised (tastes like crap and is laden with bacteria). And I've lost track of all the companies that shrank the size of the container while raising prices. Not only do government numbers lie, they'll going to kill us old folks with a chained CPI, so we can't even afford cat food. Use the Rule of 72 for figuring compound interest. Divide 72 by the interest rate to find how long to double.